A: Recently, China has begun operating a maritime observation center, a meteorological observatory and a national environmental and air quality monitoring station on reefs of the Nansha Islands. These projects are designed to observe the maritime, hydrological, meteorological conditions and air qualities and provide such services as maritime warning and forecast, tsunami alert, weather forecast, air quality forecast and disaster prevention and relief. At the end of July, China's rescue ship Nanhai Jiu 115 was stationed in the relevant reefs of the South China Sea, which has effectively strengthened the search and rescue forces in the central and southern parts of the South China Sea and provided effective safeguards to navigation security in the South China Sea. It has carried out several search and rescue operations and played an important role. As we have stressed many times, China's constructions on the reefs and islands of the Nansha Islands aim to improve civil services and provide public goods and services to countries in this region. This is what we primarily wanted to achieve when we started these works on the islands and reefs in the South China Sea, and it is also a solemn pledge China has made to countries in the region and to the international community. The projects kicked off this time will provide more public services to countries in the region and more effectively safeguard the security of navigation in the South China Sea and the production and life of the people of littoral countries. 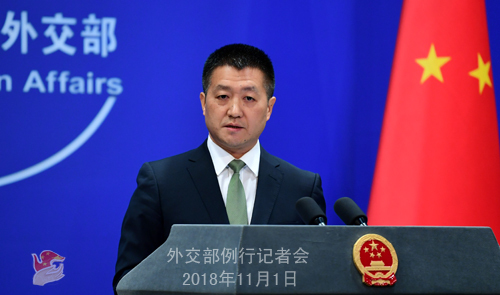 As a responsible major country, China will continue to fulfill its obligations and commitments with concrete actions and make due contributions to the security of the South China Sea and for the benefits of people in this region. Q: US Secretary of State Mike Pompeo said in an interview that, the recent measures, including charges of commercial espionage and banning of technology-selling to Chinese chipmakers, are part of the US government's strategic effort to push back against China, in a bid to convince China to "behave like a normal nation on commerce and with respect to the rules of international law". What's your reaction to that? A: We noted relevant reports. What is a "normal" nation is dependent on how you define it. Regarding China-US relations, like we said many times, China and the US are the two biggest economies in the world and the permanent members of the UN Security Council. Sustaining the sound and steady development of China-US relations, is good news not only to the two countries and peoples, but also to the maintenance of world peace and development. 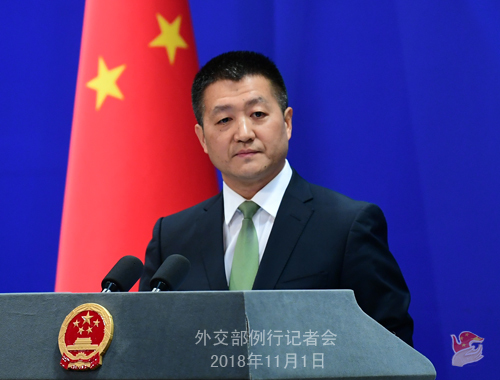 As to US Secretary of State Mike Pompeo's remarks, like we said many times, only when China and the US continuously expand cooperation, effectively manage differences, and ensure the sustained, sound and steady development of bilateral relations on the basis of non-conflict and non-confrontation, mutual respect and win-win cooperation, can we bring more benefits to the two peoples. The surveys by the Chicago Council on Global Affairs and the Pew Research Center also showed that the public in the US doesn't view China as a main threat in general. If you take a look around those states in the US, you will find that the mainstream of the Americans still believe China and the US should maintain sound cooperative relations. We hope the relevant individual in the US will awaken to this point. Q: UK Foreign Secretary Jeremy Hunt told the Upper House of the Parliament earlier this week that British diplomats who visited Xinjiang in August have confirmed reports that large numbers of Muslims are being held in "reeducation camps", and the British government expressed concerns over this. What's your reaction to that? A: We noted relevant reports. The Chinese side firmly opposes the UK in using the so-called Xinjiang-related issues to achieve certain political goals. Regarding the specific measures China has taken in Xinjiang to fight terrorism and eliminate extremism in a bid to prevent and stop violent terrorist activities, the chairman of the Xinjiang Uygur Autonomous Region has given an interview to the media and briefed them on the situation in a detailed way. I advise you and the relevant individuals in the UK to read it carefully. Q: The World Bank elevated China from 78th to 46th place in the global rankings in terms of the environment for doing business in its latest report released on October 31. Its official also said that the speed and achievements of China's reform and opening up are breathtaking. What's your comment? A: We noted that the World Bank issued its Doing Business 2019 report yesterday, which raised China from 78th to 46th place in the global rankings, up by 32 spots. We welcome that. The World Bank said in its report that China has taken a record number of reform measures in improving its business climate for small and medium-sized enterprises in the past year. The World Bank official said that China has made huge strides in optimizing its business environment, which signals the high value its government places on nurturing entrepreneurship and private enterprises. The Chinese side believes that the evaluation by the World Bank is objective and fair, which also reflects China's unswerving commitment and effective measures to deepen reform, expand opening up and continuously improve the environment for doing business. This year marks the 40th anniversary of China's reform and opening up. The Chinese side will continue to advance a new round of reform and opening up, improve business environment, and make China a preferred destination of investment for more and more foreign businesses. We welcome more foreign enterprises to operate here and share opportunities brought by China's development. Q: Firstly, US National Security Adviser John Bolton yesterday said that China is most likely stealing Russian intellectual property in order to sell copycat weapon systems for lower price. I wonder if you have any comment? Secondly, Norwegian Ambassador to China Geir Pedersen has been appointed as the UN Secretary-General's Special Envoy for Syria. I wonder if you have any comment on that? A: Regarding your first question, I know that some people in the US are worrying themselves over this and have been warning Russia to mind this or that when dealing with China. I just want to advise these people in the US not to underestimate ability of the Russian people to judge for themselves. As to your second question, China welcomes the appointment of Mr. Geir Pedersen as the new Special Envoy of the Secretary-General for Syria by UN Secretary-General António Guterres. Mr. Geir Pedersen is an experienced diplomat and we believe his assumption of the post will inject new impetus into the Syrian political process. The Chinese side will as always support the Secretary-General and his Special Envoy in stepping up mediation efforts and play a constructive role in promoting the political settlement process of the Syria issue. Hereby, I would also like to make some comments on Special Envoy of the Secretary-General for Syria Staffan de Mistura. During his tenure of office as the Special Envoy of the Secretary-General for Syria, Mr. Staffan de Mistura has made tremendous efforts to vigorously promote the political settlement of the Syria issue. China regrets Mr. Staffan de Mistura's departure from the post and fully commends and recognizes what he has done. Q: Freedom House in the US has released its annual report saying that China's restrictive Internet policies and digital surveillance have spread worldwide and the Chinese government is promoting similar measures in other emerging market countries. What is China's comment? A: Like we have said many times, cyber security is a global issue. Cyberspace is a complicated virtual world where the interests of all parties are intertwined. Its maintenance calls for the constructive efforts from the international community, including from governments, relevant industries, think tanks and media. This organization you mentioned has long been making false remarks on China-related issues. Its accusations are purely fictional, unprofessional and irresponsible. They are obviously out of ulterior motives. Q: The Australian Strategic Policy Institute has released a report on Xinjiang's reeducation centers that shows an expansion in the size of these centers since 2016. Based on satellite image analysis, the Institute found that the most expansion took place in the most recent quarter. Has the number of extremists and criminals in Xinjiang expanded in the past two years, with a faster growth rate this year? A: First of all, I wonder on what objective foundations this institution based its report and what standards this so-called satellite image analysis used? I would refer you to the relevant institution to get answers. 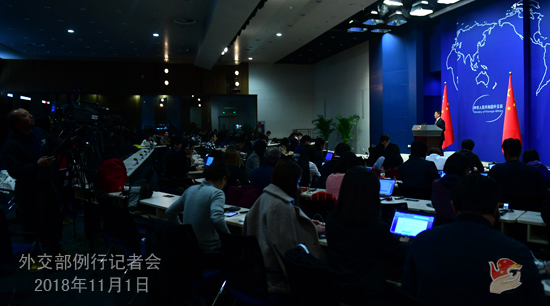 As for the current counter-terrorism situation in Xinjiang, Shohrat Zakir, chairman of the Government of Xinjiang Uygur Autonomous Region, already gave a detailed briefing to the media. With the strong support of the Central Government, Xinjiang Uygur Autonomous Region has taken firm measures. Now Xinjiang is generally stable, with the situation improving. In the past 21 months, no violent terrorist attacks have occurred, including those endangering the property and lives of innocent people. This specific figure does say a lot about the current situation. Q: According to reports, India has lodged a solemn protest over a bus service project under the framework of the China-Pakistan Economic Corridor. Reports say that this project runs through the Pakistan-controlled Kashmir, a region disputed by India and Pakistan. What is your comment? A: First, I have no information on what you said about the bus service project. Second, China's principled position on the Kashmir issue is clear. We have said many times that the CPEC is an economic cooperation initiative which targets no third country. It has nothing to do with territorial sovereignty disputes and will not affect China's principled position on the Kashmir issue. Q: We have learnt that Pakistani Prime Minister Imran Khan is supposed to come here on Friday, but we are just hearing the reports that he is leaving for China today. Has his visit been advanced? A: We have released information on Prime Minister Imran Khan's visit. At present, everything is proceeding in accordance with the plan set out by the two sides. Q: Australian Prime Minister has confirmed that the Australian government plans to help Papua New Guinea (PNG) build a new joint navy base. As China expands its influence in the Pacific, would China offer help to PNG to develop its navy force? How does China feel about the push-back from Canberra? A: When pursuing wide-ranging friendly and cooperative ties with the Pacific Island countries, China always follows the approach of upholding justice while pursuing shared interests and the principles of sincerity, real results, affinity and good faith. Our goal is to help the Pacific Island countries realize peace, stability and prosperity. This is mutually beneficial cooperation between developing countries under the South-South Cooperation framework which targets no third party. The Pacific Island countries are no "sphere of influence" for any country. We hope that the relevant parties could discard the outdated mindsets of Cold War mentality and zero-sum game, objectively and correctly view China's relations with the Pacific Island countries, and make more concrete efforts to help them realize development. Q: Norway's Ambassador to China Geir Pedersen just took office last year. Now he is leaving here soon to be the Special Envoy of the UN Secretary-General for Syria. How do you comment on Ambassador Geir Pedersen's work in China? What is your expectation for the new Norway Ambassador to China? A: On your first question, I just expressed my good wishes to Ambassador Geir Pedersen on his appointment as the Special Envoy of the UN Secretary-General for Syria. We believe that he will make his contributions to the political settlement of the Syria issue during his tenure as the Special Envoy. On your second question, China-Norway relations achieved a turn-around in 2016. Since then, bilateral ties have made great headways and bilateral cooperation in various fields has reaped fruitful outcomes, bringing tangible benefits to the two peoples. I believe you also noted that his Majesty King Harald V and Her Majesty Queen Sonja of Norway paid a very successful visit to China not long ago. President Xi Jinping and other Chinese leaders held very good talks with King Harald V. The two sides agreed to deepen cooperation including under the Belt and Road framework and enhance communication and coordination on international and regional affairs on the basis of mutual respect. We speak highly of what Ambassador Geir Pedersen has done to move forward China-Norway relations. We wish him new success in his new post.